Is the world on the precipice of another industrial revolution? The accumulating evidence increasingly supports an affirmative answer. Media outlets regularly churn out stories about factory robots with remarkably sophisticated abilities, self-replicating 3D printers, and software programs that may have the capacity to run factory operations and direct traffic along complex supply chains. As noted in a recent MAPI article, such innovations are partially a response to global competition and structural change. These challenges come in the form of low labor-cost economies that are integrating into global trade. Further, demographic shifts are burdening manufacturers with the rapid aging of the workforce and forcing them to think about the goods-producing implications of urbanization and the worldwide waning of the traditional nuclear family. If there is indeed an industrial revolution, it has come in two waves. In the early 1990s, U.S. goods producers began implementing a lean production structure modeled after modern-day Toyota and the Ford Motor Company of the early part of the 20th century. In its initial form, “lean” focused on supply chain efficiency through improvements in process management and engineering techniques aimed at the speed of production, elimination of waste, and inventory optimization. Over time, the meaning of lean has broadened so that it has virtually become the cultural mantra for the operation of a profitable manufacturing enterprise. The second wave of revolution comes from scientific and engineering advancements that have catalyzed the development of exciting new technologies. Game-changers such as robots and digital factories promise to create a manufacturing sector that would have been unrecognizable just a decade ago. Of all of these, 3D printing is perhaps the most widely covered by the media given how much it has stimulated the imagination of diverse groups, including business owners, factory managers, and educators. People who follow business and technology news appear to each have their favorite 3D printing story, whether it be the printing of a house, a car, or even human tissue. This article is based on a presentation I gave at the IEEE Computer Society’s March 2015 Rock Stars of 3D Printing conference. I consider the role of 3D technology in the industrial revolution and support these thoughts with global data on the 3D market and the results of a poll of senior engineering executives that are members of the MAPI Engineering, Research, and Development Council. I then turn to the role of 3D in the development of competitive regional manufacturing economies whose geometry is changing with the evolving production paradigm. Finally, I provide suggestions for programs that will allow the U.S. economy to gain the maximum competitive return from the deployment of 3D resources. Speed of production may be an issue in these early days of deployment, but the possibilities for what can be produced with a 3D printer appear to be limited only by the imagination. With chess pieces, cars, small houses, and medical equipment being printed, additive technology has certainly earned its considerable attention. Anecdotal evidence suggests that the flexibility of production and the fact that 3D printers can produce proximate to the point of input are already beginning to shorten supply chains in a number of industry sectors, a considerable boon for global competitiveness. But the seemingly broad capacity of 3D technology to generate product improvements and prototype new designs increases its role beyond supply chain efficiency into the even more influential area of product innovation. Of all the revolutionary capital available to the manufacturing sector, 3D has the most potential to fundamentally alter business models in that it can shape processes and products. For existing supply chains, 3D technology can give the end-user the capacity to participate in the innovation process. At the same time, as printers fall in cost and as their capabilities are more widely understood by the public, they can very well stimulate much-needed manufacturing-related entrepreneurship. Over time, certain goods-producing sectors will be populated by small but disruptive competitors, a plus for the growth and global responsiveness of U.S. manufacturing. Support for the transformative possibilities of this technology can be seen in a February 2015 poll of the members of the MAPI Engineering, Research, and Development Council, a group of senior engineering executives in mostly global manufacturing enterprises. We received 20 responses to the survey out of a group of 55 council members.For more information about the survey, email cwaldman@mapi.net. Given the small self-selected sampling framework, it would be difficult to fully generalize the results to a broader population. Nonetheless, the responses shed some light on corporate use of this new technology and could be used to frame a larger, more national, or even international study. Seventeen of the 20 respondents indicated that their companies are already making use of some kind of 3D technology. Of the remaining three, two plan to work with the technology in the next five years. Seventeen respondents are using 3D printing for prototyping as opposed to production. Thirteen described their use as being an early stage R&D effort. In terms of impact, 12 respondents indicated that their use of 3D printing is increasing product innovation activity in their business; eight said that this deployment is allowing for shorter supply chains. Respondents were asked about the nature of their 3D investments. Nine said that it was (or will be) a stand-alone investment, while for eight it is (or will be) part of their companies’ broader efforts with technology. Most appear satisfied with their 3D investments. Twelve said the technology meets their expectations and four said it exceeds expectations. Only one respondent said it is below expectations. Data on global market demand appear to corroborate these survey results in the sense of suggesting growing use.All of the data used in the balance of this section and the first paragraph of the following section are taken from a wide range of sources collected by Statista, a statistics portal service. The worldwide value of the market for 3D equipment is expected to grow from $2.2 billion in 2012 to $4 billion in 2015 before more than doubling to $10.8 billion by 2021.Wohlers Associates. The growth of 3D deployment has been remarkable. During 2008, there were 355 commercial 3D printing machines in use worldwide. By 2013, that number grew to 23,000.Hudson Valley 3D Printing. Worldwide end-user spending on 3D printers grew from $288 million in 2012 to $669 million in 2014.Gartner. The highest shares of global spending on 3D technology in 2011 came from consumer electronics (20.3%), automobiles (19.5%), and the medical sector (15.1%)—diverse but highly sophisticated industry segments that are greatly dependent upon innovation for competitive strength.Wohlers Associates, CM Research. The U.S. has dominance in the 3D market, accounting for 64.4% of global industrial additive manufacturing system production in 2011. By 2013, the U.S. alone accounted for 38% of global industrial additive manufacturing installations, significantly more than the combined shares of Japan, Germany, and China. With such a large investment, it can be reasonably argued that a national plan for maximizing competitive returns on the use of 3D printing is at least worth considering, not by any means to supplant what are already powerful market forces, but instead to enhance them. In recent years, national strategies have increasingly yielded to regional planning. Growing recognition of the independence and dramatically varying economic strengths and weaknesses among regions has catalyzed the changing policy focus. Economic research during the past 25 years or so reveals that clusters are the optimal paradigm for regional competitive analysis. A simple regional production function might very well be a good way to start thinking about manufacturing on a subnational level. For real analytical value, however, a production model needs to be incorporated into a larger framework that captures inter-industry, public-private, and cross-region linkages. The seminal thinking in this area comes from Michael Porter, although it is rooted in century-old agglomeration economy thinking from Alfred Marshall (a mentor and forerunner of John Maynard Keynes) and others. 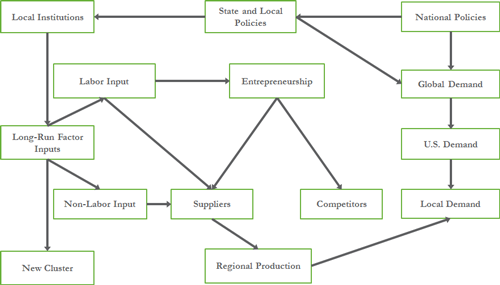 Porter empirically observed that regional economies have their own distinct behavior and cycles. He noted the presence of clusters in many regions and defined them as “a geographically proximate group of interconnected companies, suppliers, service providers, and associated institutions in a particular field, linked by externalities of various types.”See, for example, Michael E. Porter, "The Economic Performance of Regions," Regional Studies 37, no. 6&7 (2003): 549-578. Besides common technologies, externalities can include skills, knowledge, and purchased inputs. Figure 1 shows Porter’s diamond, his illustration of the cluster concept. Factor conditions are the regional supply of both tangible and intangible assets such as raw materials, infrastructure, information, research, and the legal system. Demand conditions consist of more than just the customer base. This term in the diamond has particular relevance for an innovation-generating technology such as 3D printing in that it invokes smart demand, meaning regional customers who ideally drive innovation. Firm strategy, structure, and rivalry refer to macroeconomic and political stability, labor market policies, intellectual property rules, and other variables that contribute to the climate for local business strategies and competition. Related and supporting industries include local suppliers. Research has demonstrated that there are numerous benefits to strong clusters, including faster employment and wage growth as well as stronger patenting activity and entrepreneurship. Figure 2 shows an advanced manufacturing cluster schematic developed by the MAPI Foundation. Cliff Waldman and Matthew N. Murray, Advanced Manufacturing in the American South: An Economic Analysis Supporting Regional Development, Southern Governors' Association and MAPI, 2013. Our research on the drivers of manufacturing innovation, the simple regional production function, and cluster theory all contributed to the development of this framework. The demand side of the cluster is segmented into global demand, national demand, and local demand, all of which have unique characteristics. On the factor conditions side, labor and non-labor inputs are used by suppliers to meet the needs of regional production driven by demand. Labor inputs are also the basis for new firm creation through entrepreneurship. Research shows that the local labor force is a critical driver of business startup activity in the local manufacturing sector. New firms become both suppliers and competitors to the principal industries in the cluster. Such competition is critical to the strength of a regional ecosystem in that it can motivate market-friendly pricing and innovative behavior. On the factor conditions side of the cluster, the long-run factor inputs box represents the investments needed for innovation in an advanced manufacturing ecosystem. These include education of the skilled workforce, new product development (at all levels of the supply chain, from raw material to finished product), process innovations, and public contributions that might include research and development investments. These are not direct inputs into any current regional production process but have a critical influence on the evolution of future inputs, both labor and non-labor. The role of state and local governments is well defined in the cluster schematic. National policies have a direct and indirect impact on state policies. Examples at the federal level include the minimum wage, investment in R&D, regulatory policies, and foreign trade relationships. National and state policies affect the general economic health of the region and nation, which in turn affects global, national, and local demand for the output produced by the cluster. Federal and state policies collectively influence the creation of certain local institutions that influence long-run factor input development. Examples include small business development centers, workforce training centers, and federally funded research and development centers. They can also include investments in the upgrading of local educational institutions such as community colleges. In many ways, the nexus between local institutions and long-run factor input development is the defining link of an innovation-driven, investment-driven advanced manufacturing cluster. While powerful market forces are in play, there is a direct role for public policy. In the bottom left corner of the schematic, there is a box marked “new cluster.” A perfectly functioning advanced manufacturing cluster will likely have a spreading effect through the development of new products and processes that can be the basis of new clusters. This is why advanced manufacturing clusters can be effective arrangements for the growth and development of regional economies. Indeed, research has revealed that new industries can be spawned by effective clusters. How Will 3D Printing Reshape the Advanced Manufacturing Cluster? The advanced manufacturing cluster schematic can be an effective tool for thinking about the impact of 3D technology on regional manufacturing competitiveness, defined in part by the presence of strong, innovation-driven advanced manufacturing clusters. In general, as the new manufacturing production paradigm evolves—complete with robots, smart factories, 3D printing, and lean supply chains—our advanced manufacturing cluster schematic will surely need revision. Affected supply chains will become smaller and more agile as production becomes increasingly possible at the point of supply chain use or end-user sale. The demand for high-skilled labor and labor that can function in a very new technological environment will rise dramatically. Information, in all of its many forms, will play a more dominant role in manufacturing supply chains and in manufacturing clusters as computerization increasingly drives factories and supply chains and as inventory optimization diminishes in importance. 3D technology by itself will have many impacts on the shape of regional manufacturing clusters. The relationship between the demand conditions and the factor conditions will likely become more of a two-way street as the powerful prototyping agility of 3D technology allows for Porter’s vision of smart demand to take hold. Since customers will be able to play an active role in the design phase of product development, demand could drive innovation to an even greater degree. Thus, there may have to be an arrow linking demand to the long-run factor inputs box. In general, product design in certain manufacturing industries will become a more prominent part of supply chains and therefore of clusters. A regional design box may have to be included next to the regional production box, and the interactions considered. Smaller and more agile supply chains in the industries that will be fundamentally shaped by 3D technology will allow for a greater role for new and small firms that can specialize in some aspect of 3D-driven new product development. Motivating this kind of innovation-driven entrepreneurship will become all the more important in developing optimal advanced manufacturing clusters. The positioning of the entrepreneurship box in the schematic might change in complex ways. With its capacity toward flexible design, it seems possible that 3D printing can accelerate cluster-to-cluster spillover impacts and the development of new clusters. All of this will have to take place in a newly defined legal and regulatory environment. In sum, the new manufacturing production paradigm in general and the contribution of 3D specifically certainly have the potential to drive regional manufacturing toward ever-higher levels of efficiency, innovation, and competitiveness. During this process, the architecture of regional advanced manufacturing ecosystems will change—and fairly dramatically. Given the likely competitive benefits, national and state policymakers will do well to consider local institutional investments in the deployment of 3D technology for optimal advanced manufacturing cluster formation. Regional centers conducting 3D-related research specific to the needs of the cluster will be a high-return investment. In light of the role that smaller firms will play in more agile supply networks, regional small business development centers that focus on the entrepreneurial needs of evolving manufacturing supply chains will also prove to be a smart idea. Education is critical. In regions where advanced manufacturing can and will play a part in economic competitiveness, training in new technologies should be a part of the curriculum in local schools.